Our plan was to be at the entrance to Elbe at 0800 UTC to get the tide with us up to Brunnsbuttel and the Kiel canal. We planned to stay overnight at Borkum and start early the next day. The wind was now 12-15 m/s and the sea looked wild, even inside Schiermonnikoog, the sandy island outside lauwersoog. We used the engine and “tacked” against the wind between the green and red buoys. We had the tide with usand made good progress. When we came a few miles out, we saw tourist boats where people stepped off the boats onto what was earlier the sea bottom, but which now quickly became sandy islands! Outside Schiermonnikoog, the shipping lane suddenly veered to the West, while the charts had it drawn going North East. We followed the buoys, but at one point, we could not see the next buoy and the waves (around 3 meters high over 6 meters depth) looked like they would break over the boat. On both sides the waves were indeed breaking over sand shoals. We were a bit anxious at this point, but suddely we spotted the next bouy and knew we were on the rights track after all. A little bit further out, the water got deeper and the seas got calmer. We went a bit further out before turning east. The wind was strong and we made good speed (6,7, and even 8 knots at times). Every half hour or so there was a few high waves (3-4 meters) that was threatening, but Matilda climbed over them every time. 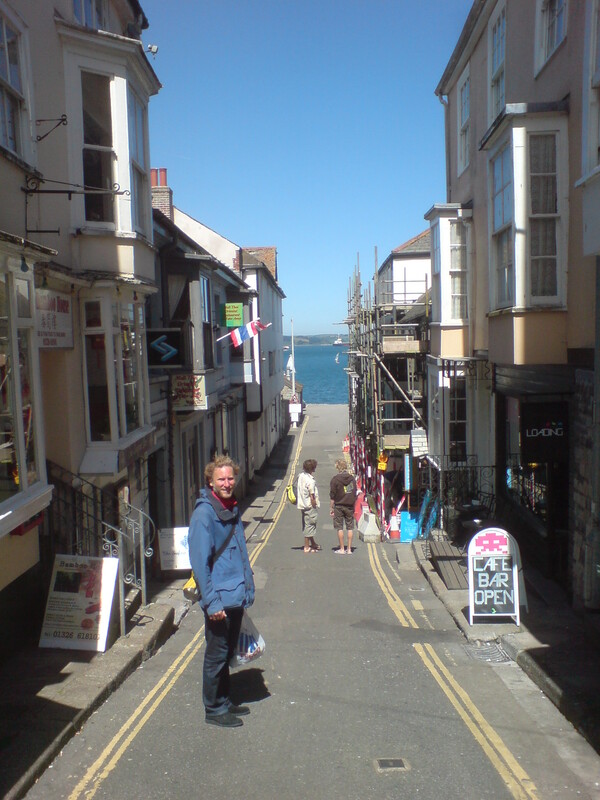 This was a sea that could make you sea sick and Urban did get sick (despite that he had sailed the Atlantic a few weeks earlier!). I felt uneasy, but was never sick. We decided that, once on the open sea, we would not go to Borkum and have to go out to sea over sand banks again, but we would go directly to the Elbe. With the good speed, we thought we could make it in time. By early morning, we approached the Elbe entrance and found we were actually 2 hours early! The entrance is very long and it was still 20 miles to go to Brunnsbuttel, so by the time we arrived there, we had a good helping tide. 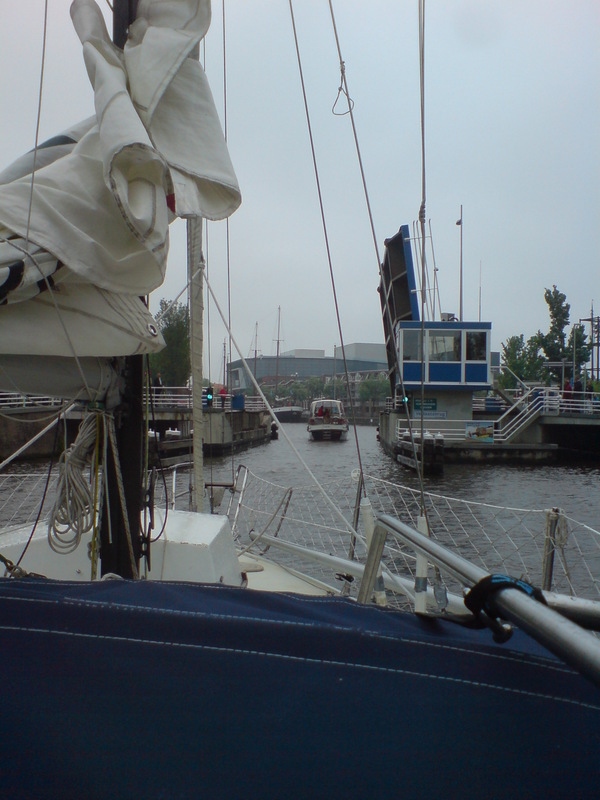 We called the Kiel canal on VHF and were allowed into the lock almost immediately. We left Dover at slack water around 6pm and went a bit north before crossing the shipping lane at right angle (with a north going tide to help us a bit…). The wind died down and once on the continental side, it was almost calm. However, the tide gave us a good push north. During the night the sea was oily and we saw lots of lights and ships around us. No time to relax, thus. By morning we were outside Oostende, but decided to go north another 24 hours. The wind was weak or nonexistent, so we motored along. During the evening and night, we had fog. We joked that without the radar, the situation would not be so fun. Two hours later the radar died…. However, it turned out that in some positions, the radar did work, while if you tried to move it, it died…. another thing to fix. The wind came back, but from the north east. Around lunch time, we were outside Den Helder and decided to go in there. We went in to refuel and to get a weather report. The report said that the north east wind would continue another day, but we would get nortwest to west wind after that. 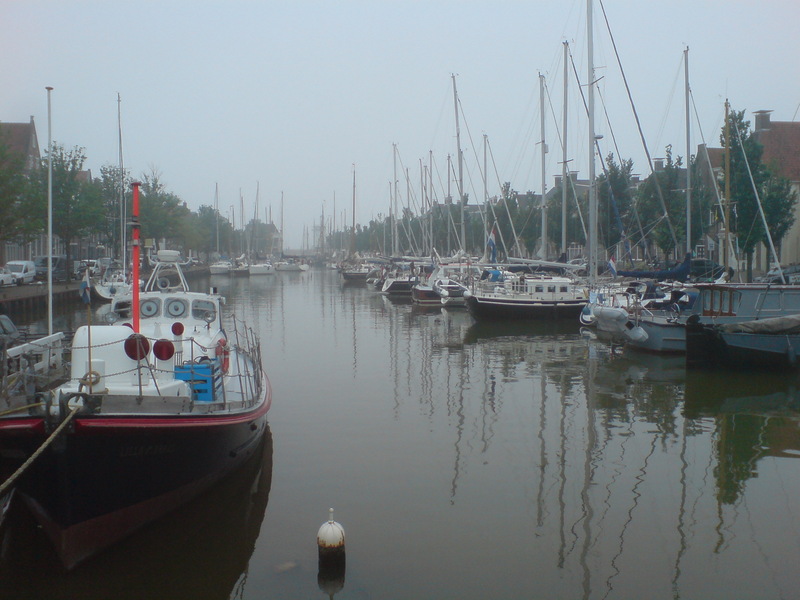 We then went into Harlingen, to go on the canals for one or two days until the wind did change. The path to Harlingen is only possible during high tide, but our timing was perfect and we have a helping, rising tide going in. 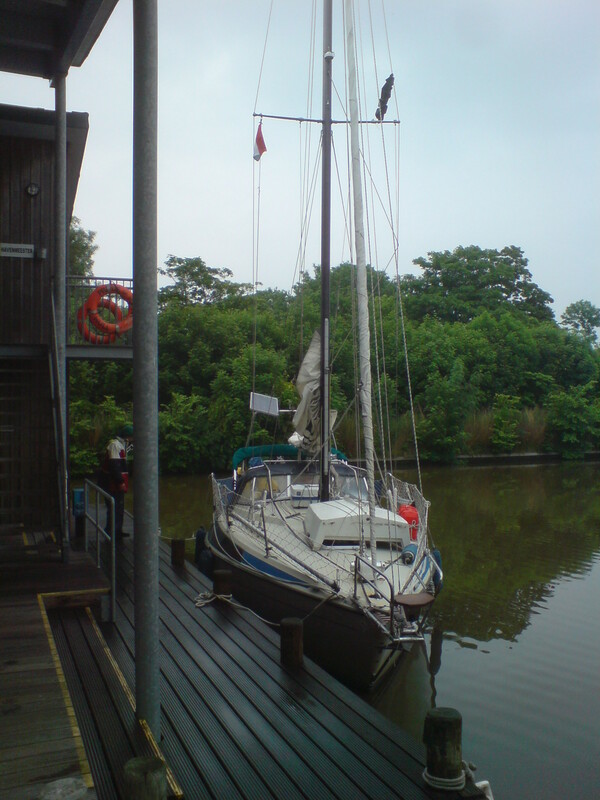 Once in Harlingen, we went through the lock and stopped in the small harbour immediately inside the lock. Perfectly calm! Harlingen is a very nice little town. On the “main square” they have the guest harbour – nice! 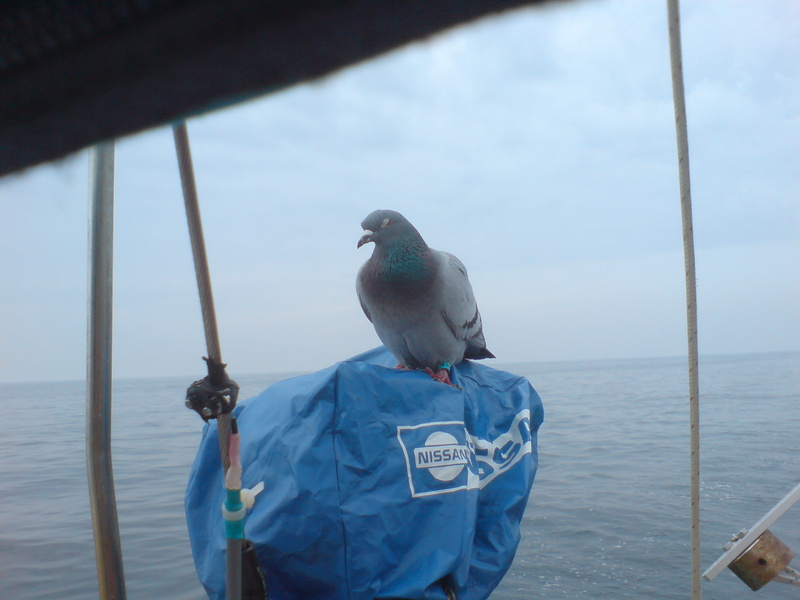 In the morning, we went to provision and then started on the “standing mast route”. Here we passed a number of bridges. Most were free, but on some, you had to put money in a wooden shoe, that the bridge attendant lowered. There were a lot of harbours and shipyards. We passed cows on fields and private back yards. Twice we misread the map. First we failed to note that the bridges were closed from1600 to 1800 and then we failed to note that not all bridges were open until 2100. We thus had to spend the night in front of a bridge outside Dokkum. 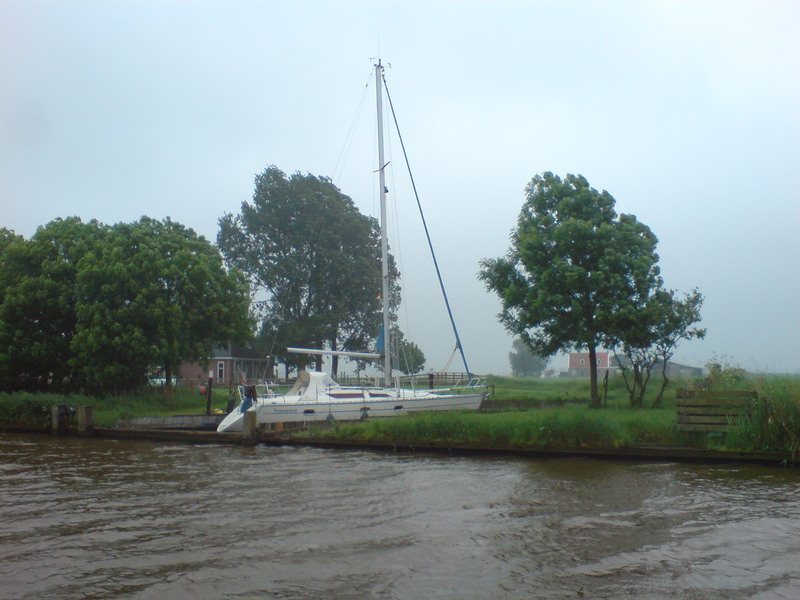 By morning, the wind had turned to NW, so we decided to leave the canals at Lauwersoog. We arrived there at high tide around lunch time and would thus have the tide with us out to sea. 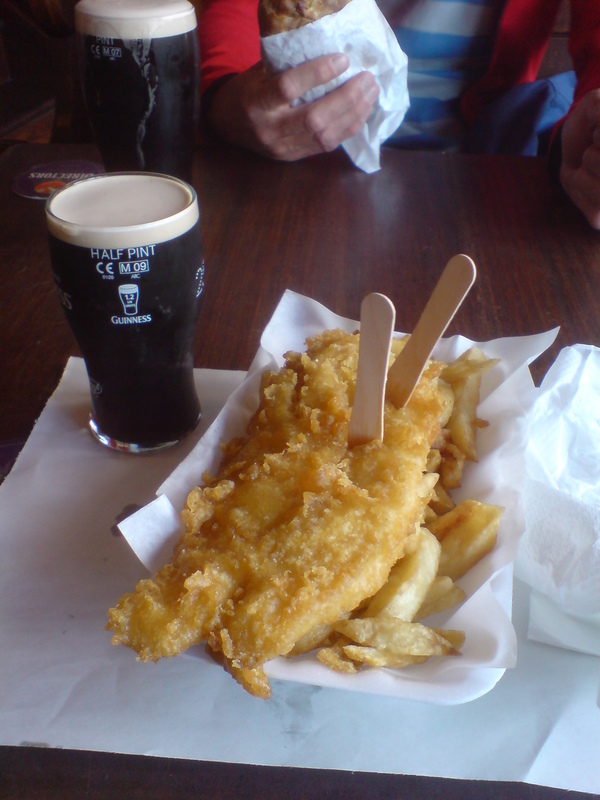 But first we had lunch and asked a dutch boat about changes in the chart. They said there were some changes to the small lanes, but the main lane to sea was well marked and would cause no problem. 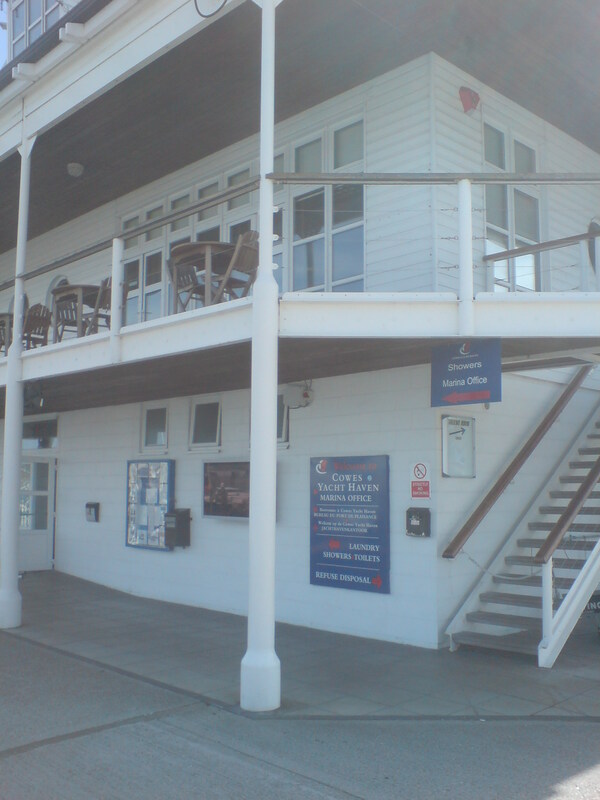 We left Cowes around 6 pm and had a strong westerly wind to take us out of the solent. However, the tide took some time to turn, so we were not completely out by the time it got dark. There were several ferries and lots of lights to keep track of – interesting exercise in navigation and great fun! The wind died down during the night and in the early morning we were sailing slowly along the south coast. We were getting worried that we would not reach Dover before dark, but the wind picked up again and we arrived with an hour to spare. 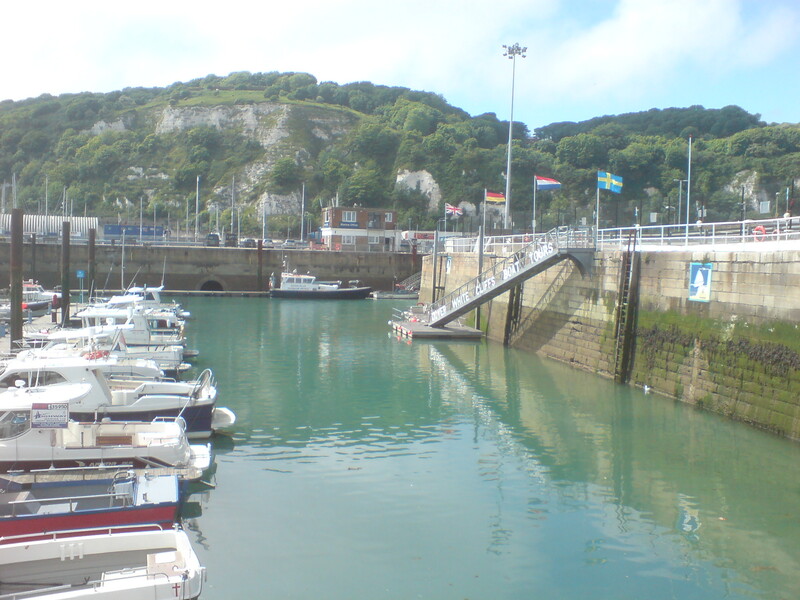 Dover harbour is very busy and you need to ask permission to enter. The “traffic lights” then turn to green and you may enter. We hade a strong tide across the entrance, so we were a little worried. 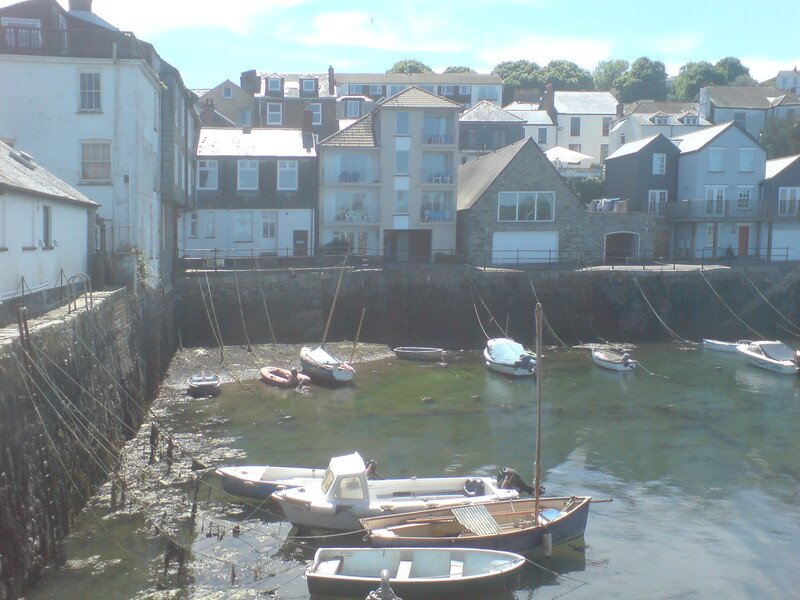 The yacht harbour is far inside and one of the most sheltered harbours I have seen. We got a place and immediately found that our neighbour was a Swedish boat. The couple had just bought it and were on their way home. 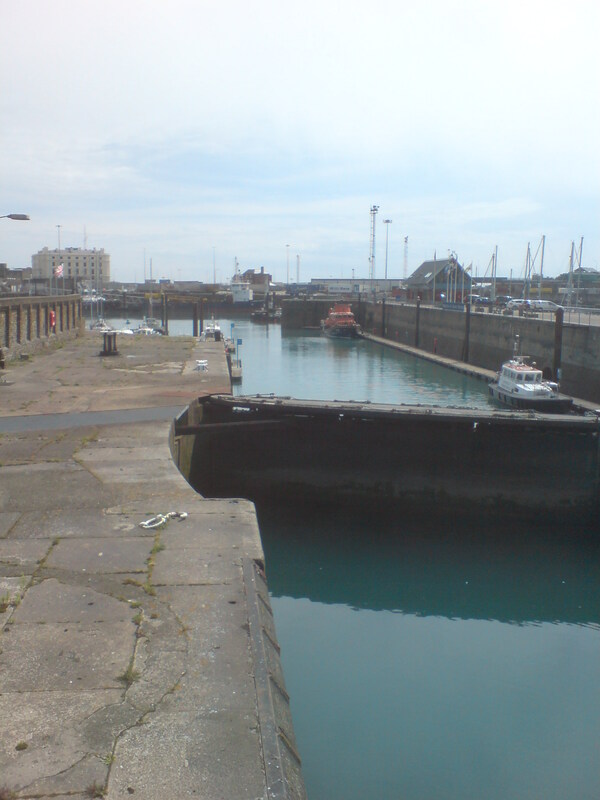 There is also a lock and an inner harbour, which is even more sheltered. 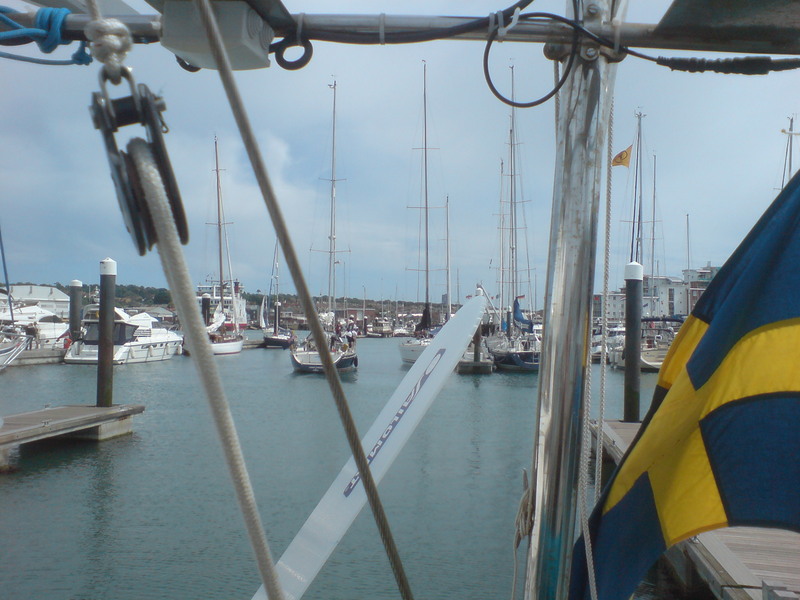 In the morning, we got up and let go of the mooring, in order to get to Cowes as soon as possible. The wind had picked up, but there was still an est going current. After an hour or so, the current decreased and the speed picked up. There were a lot of boats out and it was getting tighter as we approached Cowes. 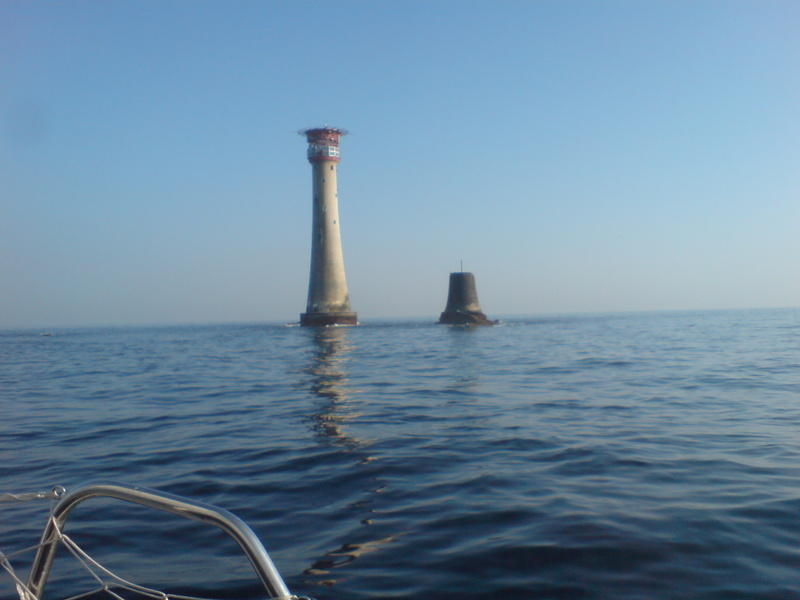 Coming into the harbour, we called the first harbour on the VHF and received instructions where to stay. We planned to stay just a few hours and then take advantage of the good wind in order to sail to Dover overnight (around 10o miles). 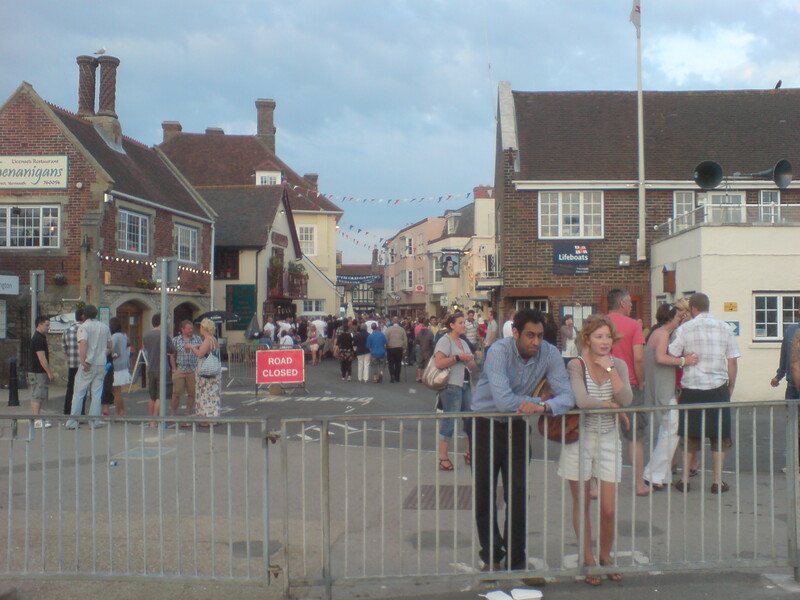 The Cowes village was a bit quiet (it was a Sunday afternoon), but the food shop and aboat chandlery was open. 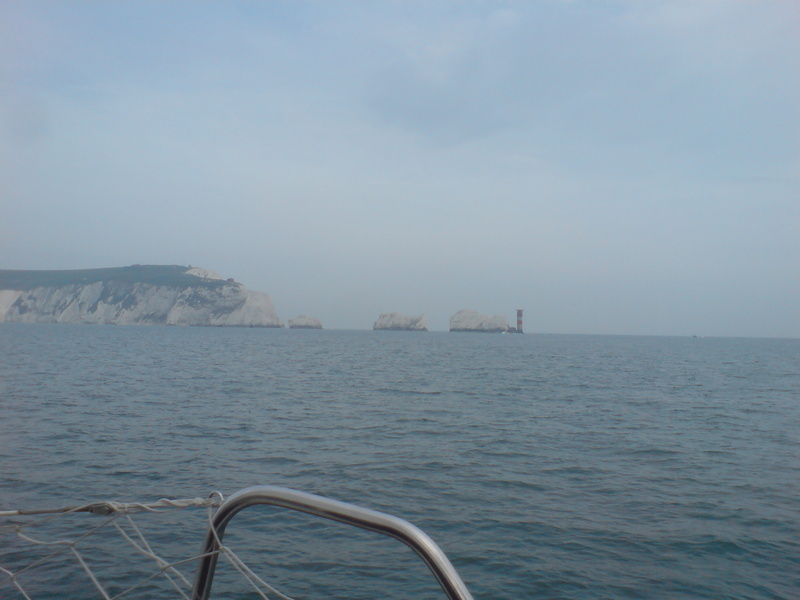 The last hours up to the Needles, we had a good favourable current. The current turned as we came in to the channel to the isle of white and the speed dropped. 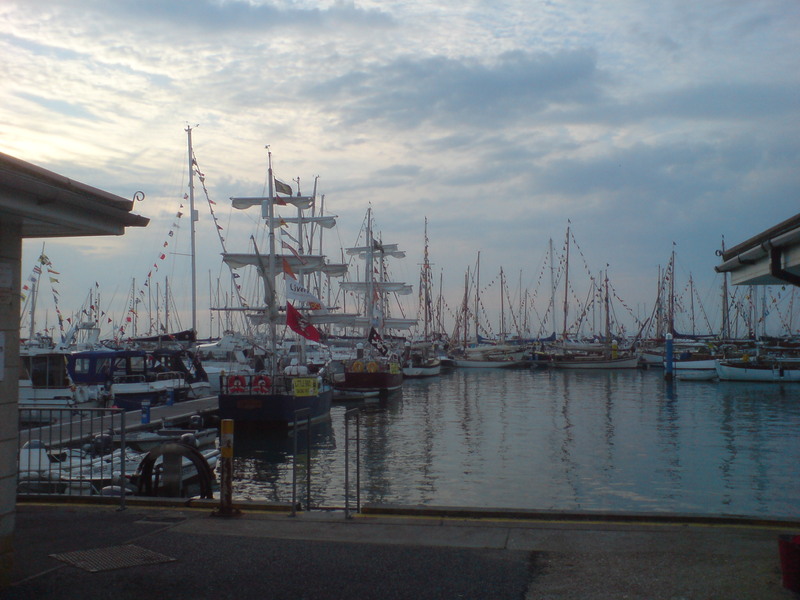 We did 1.8 knots and the 8 miles to Cowes seemed far… However, Yarmouth is just there and we had been recommended to go there – a quiet place. 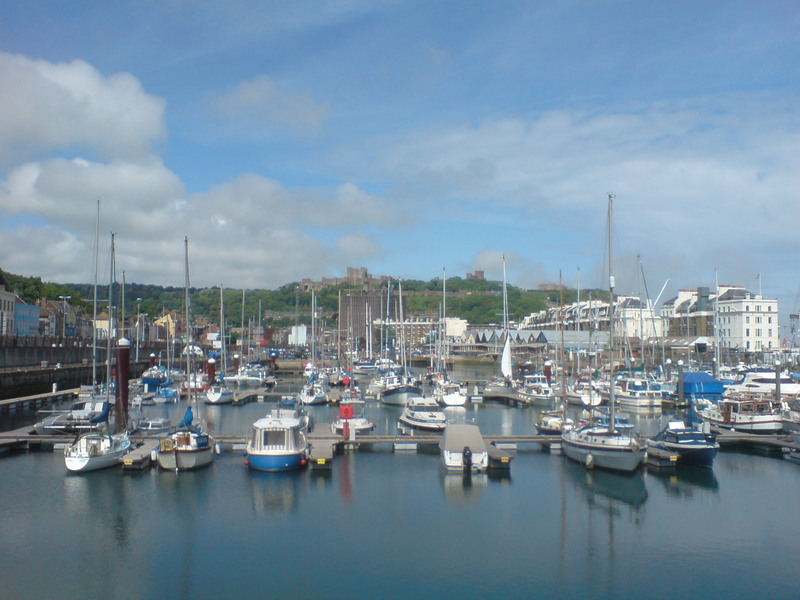 When we came into the harbour entrance, there were a lot of boats and a sign “Harbour full!”. Hoever, there were some empty buoys outside. We found one “for max 9m loa”, but since Matilda is just over 9m… we took it. A water taxi took us ashore and we ended up in an Old Gaffers event. 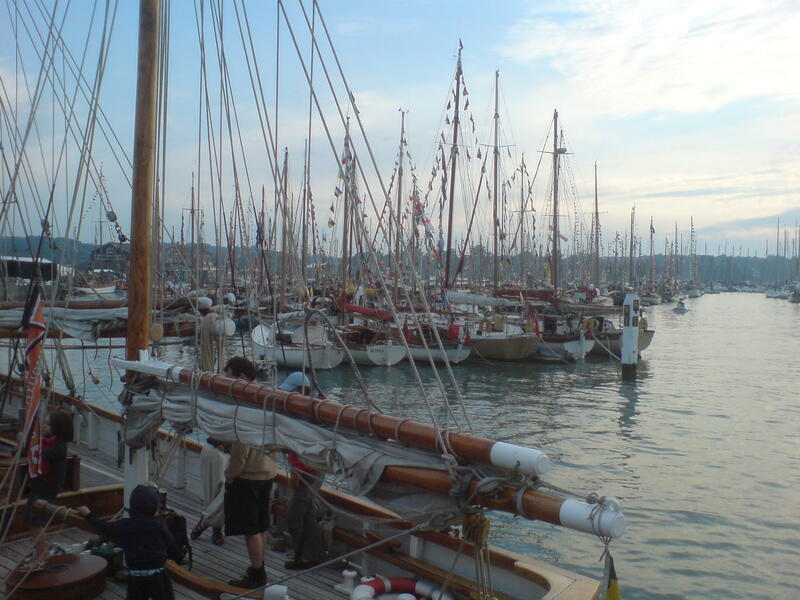 Some 160 gaffers were moored in the harbour and there was a big party going on. We walked the treets . 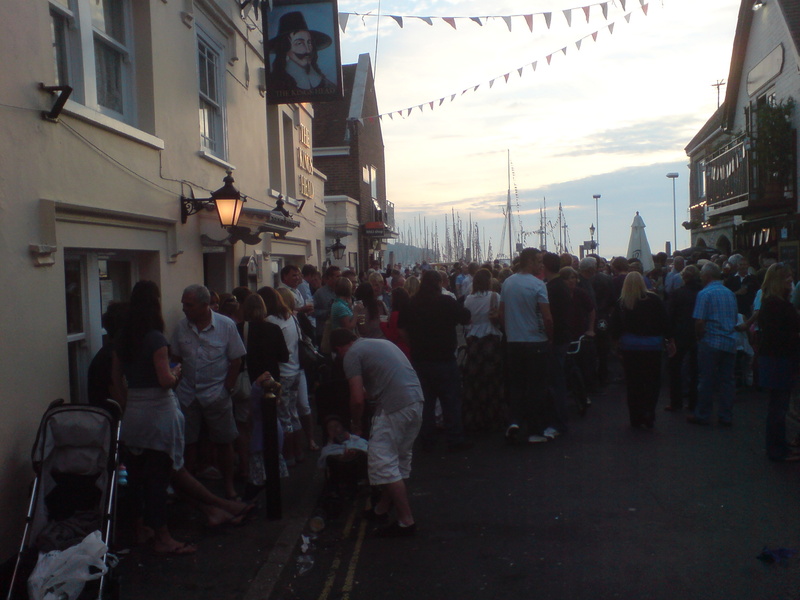 looking at the people and had a few beers in the bars… Very nice! Urban, the captain that sails the boat back to Sweden, was being abandoned by his crew, and I had promised to come down to England to help out if needed. Thus, I boarded a flight to London and took the train to Cornall. A beautiful place! Urban met me at the train station and we went down to where the boat was moored. She looked a bit worn, with weed growing on the waterline and rust stains on the deck, but otherwise in good shape. We spent the next day getting organised and drying matresses. It was a beautiful summer day. There was a strong E wind, so there was no sense to try to sail eastwards. The next day, the E wind was supposed to swing to the S, so we set off. We used the engine, since the wind as weak. However, it turned out that the wind stayed weak all the way, so we ended up using the engine all the way to the Isle of White, some 138 miles and 30 hours. We were lucky to have a weak wind against the tide, that had started to go out. I flew from Martinique to Paris on March 19th and then on to Copenhagen. Coming home feels strange, but good at the same time. My family has been longing for this moment and it feels good that they are happy. The first night at home, the floor was rocking when I got out of bed. A strange feeling. I also woke up last night after a strange dream that there is something wrong with the boat. My wife found me sitting up in the bed, mumbling that there is something wrong with the sun roof… I guess it will take a week or two to adapt to life ashore! Now that I have a stable Internet connection, I have uploaded pictures to earlier posts – Enjoy!